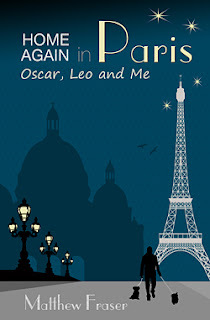 I have traveled to Paris many times this summer on the pages of different books, but this book Home Again in Paris: Oscar, Leo and Me by Matthew Fraser, has to be my favourite. Matthew spent his student days in Paris before returning to Canada and settling down with his wife and a successful TV career. However, following her sudden death he finds himself inexplicably drawn back to Paris with his two Bichons Oscar and Leo for company. He shares their story of settling into Poodleland (Paris’ posh 7th arrondissement) in an open, honest and beautifully worded way. It is not always happy, things do go wrong, but his eye for the detail of where he lives in Paris and the people he meets is perfect. It is a memoir, but it is more than that and there are many insightful passages that help to explain the French way as he sees it. And as he has spent a lot of time over many years in Paris, I think he is well placed to voice his theories. Even I, a total Francophile learnt things from this book. In short, I loved this book, couldn’t put it down and was very sad when I finished reading it. I’m not sure I have ever come across anyone sharing such love and emotion for their dogs and I’m not ashamed to say he brought a tear or two to my eyes at certain points during the book. It certainly wins my ‘tearjerker of the summer’ award. I am delighted that Matthew contacted me about his book and has also been generous enough to offer me an ebook copy to send to one lucky reader anywhere in the world. To enter please email frenchvillagediaries@gmail.com with Home Again as the email subject. The winner will be the first name picked from my sunhat next Monday 9th September. Home Again in Paris: Oscar, Leo and Me is available as an ebook from Amazon and a link to the UK site can be found below. This book is certainly worth the £1.95 price! You can read more from Matthew on his website here or follow him on Twitter. As a doggy person, you'll love it Sara Louise. Sorry Jacqui, did I send you an email.. This competition has now closed and the lucky winner has been notified by email. Thanks to all those who entered. Oh no, i've missed out on the competition. The book sounds wonderful and exactly the sort of moving to France memoir that I love to read. Will definitely check it out. Oh, sorry Louise. It is a very good book, hope you enjoy it!